Looking at the magnificent frescoes of the Sistine Chapel, its majestic images, one cannot again be amazed at the ingenious skill, multifaceted talent and unsurpassed fantasy of Michelangelo Buanarotti. They are amazed not so much by the biblical plots themselves, but by their thorough execution and attention to the smallest details of any frescoes, whatever they take. And there is no need to talk about the riot of colors, because seeing all this around you on the walls and ceiling of the chapel, you see. that the artist has achieved what he wanted. Namely, that these colors and pulls called unearthly. 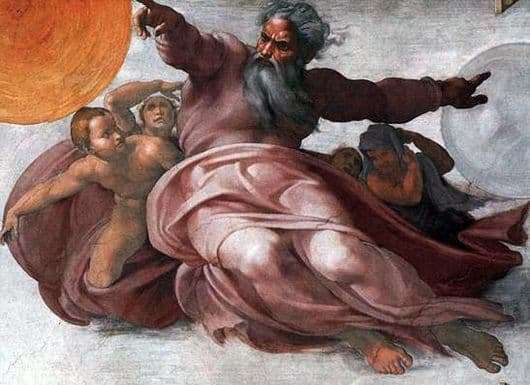 As for the fresco “Separation of Light from Darkness”, then, according to Michelangelo’s plan, the energy of truly non-transferable power was to flow from it. But how can it be? After all, in the center of the plot – Savaof, creating the heavenly bodies, Light, Darkness and then separating them from each other, thus bringing the world day and night. The mighty old man, soaring in the space hitherto empty, endows him with cosmic bodies, creates matter and essence, creating all this with the help of divine energy and supreme love, which Chas does not like at all, trying to prevent the Creator and, naturally, suffering defeat.